A selection committee interviewed and ranked each of the three candidates vying for Nevada City's one medical cannabis dispensary business license. An average score for each ranking, separated into categories,was submitted to the city council for consideration in making a final selection Wednesday. The numbers in red denote the highest scores in specific categories. 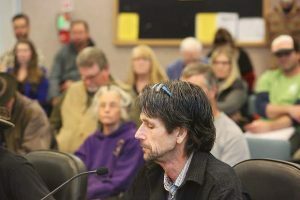 The Nevada City Council confirmed its selection of Elevation 2477’ as the city’s first medical cannabis dispensary Wednesday, much to the dismay of Mayor Duane Strawser and Council Member Reinette Senum. Controversy ensued, resulting in the city council’s decision to amend Nevada City’s marijuana laws and allow three dispensaries rather than just one — a move that will need further approval in the coming months. In November, council members voted 3-2 to award the city’s first dispensary license to Elevation 2477’, which was selected from a pool of three candidates. Given the opportunity Wednesday to amend that choice, the council stuck by its decision. But Strawser and Senum, who voted last month for one of the other two dispensary candidates, Growing Community, expressed disappointment in the majority’s choice and the way it was made. Strawser and Senum made a push to revisit the decision Wednesday, saying they’d like to take time to discuss whether the city followed the selection process it adopted, but the city’s attorney, Hal Degraw, said that was only possible if one of the three council members who voted for Elevation was willing to bring back the discussion. “We’re not revisiting the process, because I do not believe the three of us that voted for it are willing to go back and start this process again,” said Council Member Evans Phelps. The council again voted 3-2, with Senum and Strawser opposed, affirming the decision to award Elevation a license. 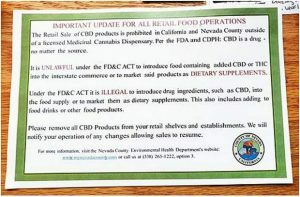 The disagreement started when city council members were asked last month to vote on which of the three candidates who applied to operate Nevada City’s first dispensary should be awarded a permit. In the weeks prior, a selection committee, comprised of two city council members and city staff, evaluated each application, conducted interviews with the candidates and submitted a ranking of each prospective dispensary to the city manager, who then averaged those rankings and presented them to the city council. 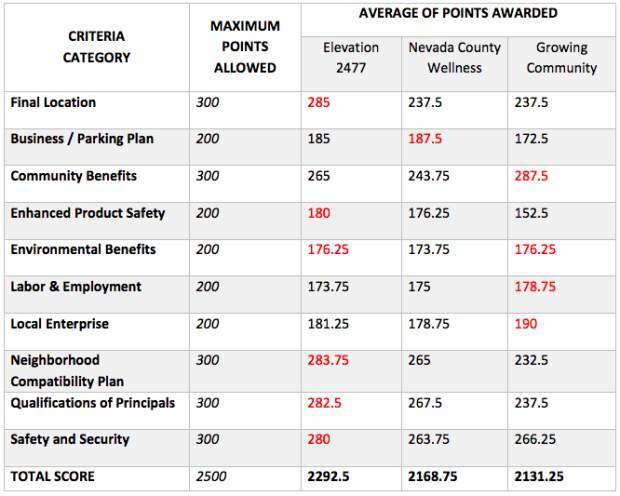 Elevation 2477’ was ranked highest by the selection committee, Nevada County Wellness was ranked second and Growing Community was ranked third, based on factors including location, community benefits, safety and security. According to Council Member Evans Phelps, each selection committee member independently ranked the candidates in that order. The dispensary applicants then gave presentations to the city council during a public meeting last month. Community members showed up to express their opinions on which candidates they liked best, and the vast majority spoke in favor of Growing Community, an applicant that proposed giving all its proceeds to local nonprofits. But the majority of city council members voted for Elevation 2477’, saying they were sticking by the process the city adopted and using the ranking system as the primary indicator of the best candidate, rather than basing the decision on the opinion of those who showed up to their meeting. Senum and Strawser called the ranking system a guideline, not an absolute, and said they felt the selection process was undermined by the other city council members who went by the numbers. In an interview, Senum said if she’d known the council was going to weigh its decision so heavily on the ranking system, she would have asked for more details behind the selection committee members’ evaluations. She also would have requested all five city council members sit on the selection committee, she said. Many community members also said they thought the choice was unfair. Jason Rainey, president of Growing Community’s board of directors and Nevada City’s newest planning commissioner, appointed by Senum in July, said the city wasn’t following the procedure it set up to select the top candidate. The final phase of the city’s dispensary selection process, a staff report states, lists four numbered steps, calling for: 1. a public meeting of the top three candidates, 2. the city manager’s final review and evaluation, 3. a final staff report presented to the city council and 4. city council’s final selection. Senum and Strawser agreed. Both said they thought the city didn’t follow its process and came to a final decision too quickly, before there was time to digest the public’s comments or discuss reasoning behind the selection committee’s ranking. Council members noted all three candidates seemed qualified to operate. In an effort to compromise, the council discussed amending Nevada City’s marijuana laws, which say that only one dispensary is allowed to operate for a year. After a year, the city manager is expected to provide the city council with a report examining the first dispensary’s impact on the community, city code states. If, after hearing the report, city council members determine that “there are no significant consequences of allowing these medical marijuana businesses to operate in the city,” the city council can allow up to two more dispensaries to join the market. According to Strawser, that rule was adopted in an effort to move slowly and listen to the concerns of residents who don’t support any marijuana businesses in Nevada City. But the council, with a 3-2 vote Wednesday, directed city staff to change the rules, allowing the other two dispensaries who applied — Growing Community and Nevada County Wellness — to operate sooner. The council will vote to approve the change in the coming months. Daniel Batchelor, Elevation’s chief executive officer, said he’d welcome the competition. “I’m in favor of there being more than one dispensary. I’m not sure if three would survive, but I am in favor of more than one,” he said. To contact Staff Writer Matthew Pera, email mpera@theunion.com or call 530-477-4231.